Would Your Year Be Better if You Lived on $9733? Globally, the median household income is $9733. The average life expectancy at birth is 71.0 years. Here in the US, the median household income is $51939, and the average life expectancy is 79.3 years. In other words, although there is a correlation between income and life expectancy, the correlation is not proportionate. If you want to dig into this topic more deeply, Google "Preston curve". Here's my question: is it worth our trouble to earn that extra $42K a year, to add another 8.3 years onto our lives? In trying to gain more years, are we wasting our days? What if our families voluntarily chose to live on $9733 a year? There would be more lasagna and motorcycles and mobile homes and fewer Brussels sprouts and SUVs. But although our lives would be shorter, we would either have a lot more time for serving (if we chose to work less) or a lot more money for giving (if we continued working the same amount). Have you already taken steps in this direction? I would love to hear your story! Wrestling with a particular aspect of your expenditures? Share your quandary, perhaps someone will have an idea for you. What a person loves, enjoys, delights in, and likes reveals the kind of person he is and will become. "The worth and excellency of a soul is to be measured by the object of its love. He who loveth mean and sordid things doth thereby become base and vile, but a noble and well-placed affection doth advance and improve the spirit into a conformity with the perfections which it loves." This applies even to the kind of movies a person enjoys. So, for what it's worth (or perhaps I should say, for what I'm worth) here are my ten favorite feature films. 10. Jesus. The most translated, most viewed film in human history. Available online for free in over a thousand lip-synced languages. Unlike most Bible movies, this one is quite accurate. 9. The Runner from Ravenshead. Cute child actors deliver a message that even adults need to hear. 7. Pamela's Prayer. Beautiful portrayal of what a Christian courtship can look like. 6. The Appointment. Tense, sobering reminder that it is appointed for men to die once, and then comes the judgment (Hebrews 9:27). 4. Fireproof. My favorite of the Kendrick brothers' productions, because I feel the gospel is presented most clearly in it. 3. Treasures of the Snow. A story of costly forgiveness set in Switzerland. 2. Time Changer. Is belief in Jesus necessary for society to have morals? Professor Carlisle finds out, with the help of a time travel machine! And my all time favorite film? 1. Behind the Sun. The story of a young Muslim man who becomes a Christian, and must decide how much he is willing to lose to follow Jesus. I plan to write in Jesus for President on my ballot this November, and I hope you will also. I'm not joking. I realize that some people still think that the Messiah is named Hillary or Bernie or Donald or Ted. But this year Christian Americans should realize there is no moral majority, there is no political solution, and there is no hope for improvement unless God intervenes. 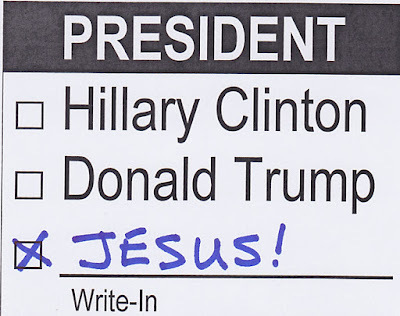 So this year let us throw away our vote as a public plea for Jesus to save us from ourselves. Putting the "Awe" back in "God"
Despite regular practice of spiritual disciplines, I frequently get into a rut in my relationship with God. It's dangerous when God becomes routine and the Bible becomes boring and we hunker down to try to simply remember what we already know. The "o" in God begins to be pronounced "oh" instead of "awe". A friend recommended a Bible study. Behold Your God is a 12 week curriculum consisting of daily workbook exercises and a weekly DVD lecture. It was produced by a guy I never heard of. After looking at the web site I decided it was probably yet another case of someone taking a few great doctrines, pre-digesting them to remove most of the flavor, putting them in a slick media package, and charging way too much. Fortunately my parents are not as "discerning" as I am. They bought a set. We started the study as a family. Within a few days, I began realizing that this "guy I never heard of" was actually presenting meaty truths about God in a very penetrating, insightful way -- as if he did not merely know the truths, but had experienced them. He navigated through precarious theological concepts, where many another teacher has wandered into error, with remarkable precision and fidelity to Scripture. The study left me with a new level of wonder about and joy in God. I have discovered more facets of His character that I have not yet explored. And it is clearer than ever how His character should affect mine. Buy a set, find a few Christian friends, and dig in together. If you can't afford it, sell something! Seriously! I may lose some heavenly rewards for telling you about this, but hopefully it will result in you getting a few of your own. Recently I was in Safeway, checking out. The bedraggled-looking guy in line behind me was holding only a bag of chips. I remembered reading a Mark Cahill* newsletter four months ago about using random acts of generosity to honor Jesus. As the cashier finished scanning my items, I told her, "I'll buy his chips." She was stunned. So was the man. 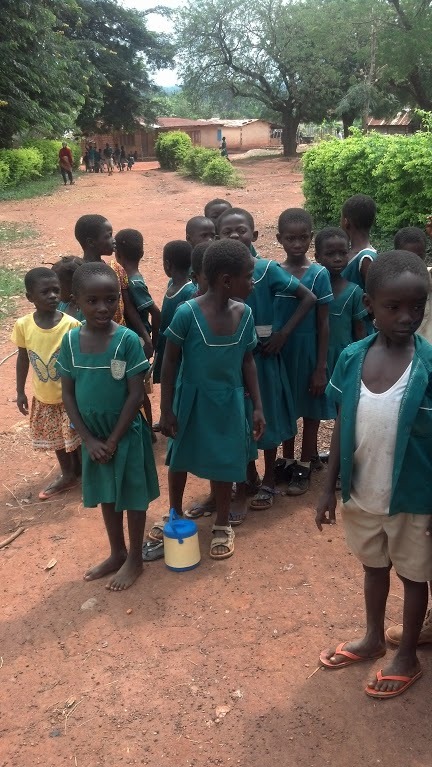 I told him, "Jesus said, "It's more blessed to give than to receive. I've found that to be true." 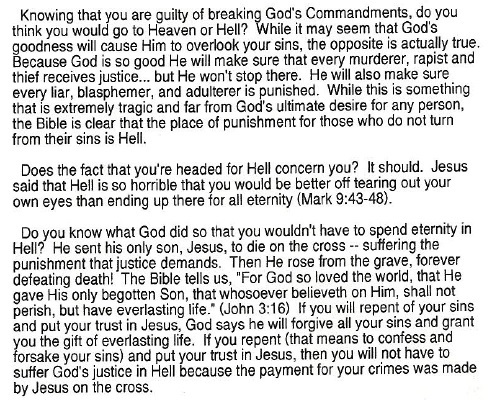 (I wish I had said, "He's been so generous to me by dying to take the punishment for my sins." Hopefully next time.) He looked me square in the face and said, "Thank you for living out the gospel." I only regret that I took so long to try Mark's idea. Don't be so slow! * I recommend reading the newsletter I linked to, but this does not mean I endorse everything else Mark Cahill has written or said. This video is well worth your three minutes. If non-Christians can do something so wonderful simply to promote Samsung, why can't Christians do stuff like that to promote the glory of Jesus? I mean that. It would be wonderful for Jesus-followers to conspire together and go to great trouble to bless specific people who haven't earned a blessing. In fact, Jesus Himself is already doing that. He plans intricate timings, complicated sequences of causes and effects to bless specific people, and not just for a month in advance like this one. Some of Jesus' plots take hundreds or thousands of years to come together. And while Samsung showed kindness to a gentle man unable to hear, Jesus shows mercy to His enemies -- rebels unwilling to hear His voice! My school photo in 1994. I don't have many photos of myself from this period of time, because I was not eager to get my face in front of a camera. Be friendly, not shy. People are more understanding and sympathetic than you might think. They aren't thinking about how terrible you look. So stop thinking about it yourself. Greet people warmly and be interested in them. A smile covers a multitude of blemishes. Appreciate your friends. If any people actually start avoiding or mocking you because of your appearance, it shows that they weren't your friends to start with. Acne filters your fans and weeds out the ones who love you just for the way you look. Think long term. This too shall pass. 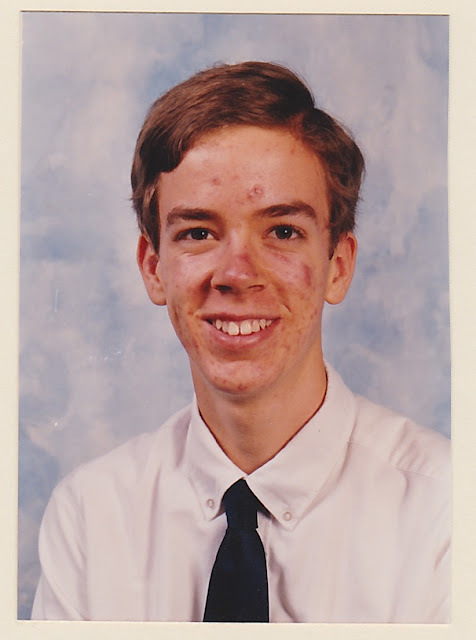 If you don't follow Jesus, you will go to hell, in which case your body will be destroyed by something far more terrible than acne. If you turn from your sin and trust in Jesus, you will go to live with Him, in which case you will get a new, perfect body (and you'll be more interested in His scars than in yours). Worship Christ, who relinquished beauty - for sinners like you. I discovered these verses while I still had acne. It amazed me, and still does, that Jesus chose to come in a wrapper that was not appealing. And He did it for evildoers like me. I'm indebted to John Piper's "Don't Waste Your Cancer" for the title of this post. I thank Jesus for the political influence of Antonin Scalia. Not that I agreed with all his rulings, but for the most part, he did his job well, a sort of lone prophet crying out against a political world gone mad. A friend gave me a copy of the eulogy delivered by Justice Scalia's son Paul, who is a Roman Catholic priest. For me it is heart-wrenching. Those words are among the best I have ever heard at a funeral. I hope someone says that at mine! "Even when the deceased was an admirable person, indeed especially when the deceased was an admirable person, praise for his virtues can cause us to forget that we are praying for and giving thanks for God's inexplicable mercy to a sinner." But then sprinkled heavily throughout the eulogy there are also tragic evidences of the Roman Catholic Church's departures from Scripture. In particular, the belief in purgatory, and praying for the dead and indulgences as a way of leaving purgatory more quickly. We continue to show affection for him and do good for him by praying for him: That all stain of sin be washed away, that all wounds be healed, that he be purified of all that is not Christ. That he rest in peace. Further, we give thanks that Jesus brought him to new life in baptism, nourished him with the Eucharist, and healed him in the confessional.... He trusted the power of her sacraments as the means of salvation as Christ working within him for his salvation. This is heartwrenching to me because all of this indicates that at the end of the day and the end of his life, Antonin believed he would go to purgatory, not heaven; that additional perfection and purification would be necessary in his life before he could enter Christ's presence. Apparently he did not claim to have the righteousness which comes from God on the basis of faith (Philippians 3:9). He could have gotten it with no need for suffering in purgatory, no need for sacraments, no need for people to pray for his departed soul. Like the tax collector who beat his chest and simply cried, "God be merciful to me, the sinner!" (Luke 18:9-14) Antonin Scalia could have gone home declared righteous by God. 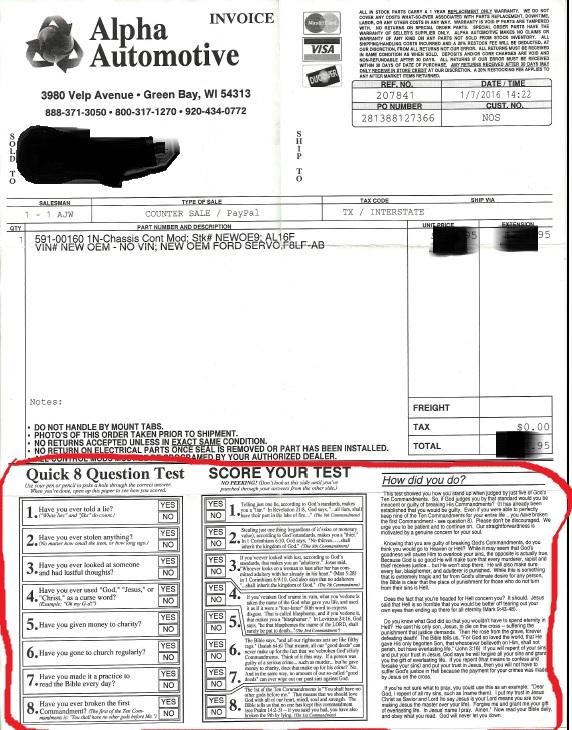 Recently a friend made a purchase online from Alpha Automotive, in Green Bay, Wisconsin. He forwarded a copy of his receipt to me. I dare say you may never have seen a receipt like this before! The red highlighting and blackouts are mine. I recently was introduced to the hymn "Facing the Task Unfinished", by Frank Houghton. You can sing it to the tune of "The Church's One Foundation" (Aurelia). Some subjects are inexhaustible. Five local churches, including ours, are joining together on Saturday, January 23, to hold a conference about the gospel. The conference is free, including lunch! I would love to see you there. Topics: What is the gospel? How does the gospel make me right with God? How do I live out the gospel? How do I proclaim the gospel? Reuben Archer Torrey did not have the folksy warmth of his mentor D. L. Moody, nor the intellectual depth of Edwards, nor the eloquence of Whitefield, nor the theological precision of Spurgeon. Compared to these giants, he was a grade "B" preacher. But he was a busy B, starting both the Chigago (now Moody) Bible Institute and the Bible Institute of Los Angeles (now Biola University), conducting worldwide evangelistic tours like an early Billy Graham, and spearheading the conservative response to theological liberalism through the publication of "The Fundamentals". The man was driven. Torrey does not get as much press as the giants in whose shadow he followed. And rightly so. Nevertheless, when I learned that Fred Sanders had compiled a biographical portrait of Torrey using Torrey's own sermons and that Moody Press would give me a copy for free in exchange for an unbiased review, I quickly clicked okay. 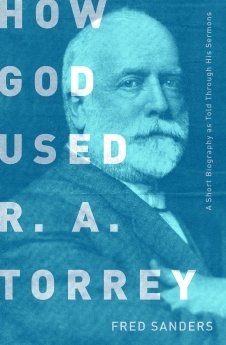 How God Used R. A. Torrey contains thirteen complete sermons by Torrey, interspersed with short biographical bridges. These sermons are sometimes bland, a tad repetitive, and occasionally wrong. Nevertheless, they reveal the sincere heart of a man burning with burden to point his listeners to Jesus. His "Found Wanting" contains an exposition of the 10 Commandments that sounds like something straight from Ray Comfort. But Torrey was more storyteller than expositor, and the Lord blessed him with some amazing life experiences to tell about. His sermon "Why God Used D. L. Moody", while containing only one verse of Scripture, is jammed with powerful stories of his mentor's love for Jesus. Should you buy this book? If you don't read much, my recommendation is that you stick with reading more substantive dead authors such as Spurgeon. But if you are a bookworm and enjoy biographies of Christian leaders, you will enjoy this book. Most of the sermons contained in the book are available online, so you can read some to get a taste for free. I also have a copy I'll give to anyone who will pay the postage for me to mail it to you!